are recognized as one of the largest components of the solid waste stream in the US. While much of this material is recycled for purely economic reasons, avoidance of landfill disposal of materials such as concrete, wood, gypsum drywall and asphalt shingles has benefits well beyond financial ones. C&D materials recycling results in a greater job creation and industrial activity relative to landfilling. Avoidance of landfilling also provides for a greater degree of environmental protection, a smarter use of natural resources, energy savings, and a net decrease in greenhouse gas emissions. Dr. Timothy Townsend‘s research into the economic and environmental impact of C&D recycling is summarized in this report. The numerical estimates presented herein were determined using available C&D industry data from the literature, additional information surveyed from the C&D recycling community, and the authors’ professional experience. * The Construction and Demolition Recycling Association promotes and defends the environmentally sound recycling of Construction and Demolition (C&D) material through a diverse and unified voice of members committed to sustainability. * Portions of Senate Bill 54, Section 260.211, went into effect beginning Jan. 1, 2008, increased the fines and penalties for the illegal dumping of construction and demolition waste making it a much more serious violation. * Missouri Asphalt Pavement Association offers educational information on asphalt shingle and used tire crumb reuse in asphalt paving. There are over 20 Habitat Restores in Missouri. Donate your reusable fixtures, leftover construction materials, appliance, furniture and much more to be recycled. Your local Restore offers low prices for materials you will need on your next construction or DYI project. Habitat for Humanity ReStores are nonprofit home improvement stores and donation centers that sell new and gently used furniture, home accessories, building materials and appliances to the public at a fraction of the retail price. Habitat for Humanity ReStores are proudly owned and operated by local Habitat for Humanity affiliates, and proceeds are used to build homes, community and hope locally. More than 325 million tons of recoverable construction and demolition (C&D) materials are generated in the United States annually. These materials include aggregates such as concrete, asphalt, asphalt shingles, gypsum wallboard, wood and metals. C&D debris is a significant issue in Missouri making up about 14.8% of waste stream. A large fraction of C&D debris ends up in municipal solid waste landfills or in special C&D landfills as observed during MDNR's 2008 Waste Composition study. Sustainable Materials Management, SMM, refers to the use and reuse of materials in the most productive and sustainable way across their entire life cycle. SMM conserves resources, reduces waste, slows climate change and minimizes the environmental impacts of the materials we use. Materials included in C&D are steel, wood products, drywall and plaster, brick, clay tile, asphalt shingles, asphalt concrete and Portland cement concrete. These materials are used in building as well as road and bridge sectors. Generation estimates represent C&D amounts from construction, renovation and demolition activities for buildings, roads and bridges. 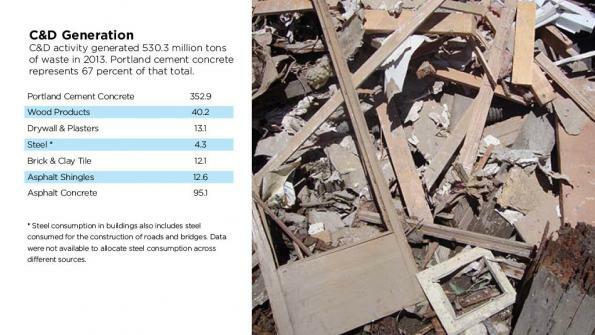 In 2013, 530 million tons of C&D debris were generated. C&D debris is not included in MSW numbers. Each year, almost 10 million tons of roofing shingles are removed from rooftops or hauled away as scrap from manufacturers. Roofers and shingle manufacturers used to haul them off to the landfill, but today many are sending them to the local hot mix asphalt (HMA) plants for grinding to be added to hot mix. Missouri has over 33,000 miles of surfaced roads so there is a high demand for the recycled asphalt shingles. The Missouri DOT’s (MoDOT) research on tear-off scrap shingles resulted in a new shingles recycling specification in early 2005 recommending 2 to 5 percent ground shingles in the mix,. Recyclers like ECO Recycling, are responsible for receiving the mixed roofing material, then sorting, grinding and screening it.